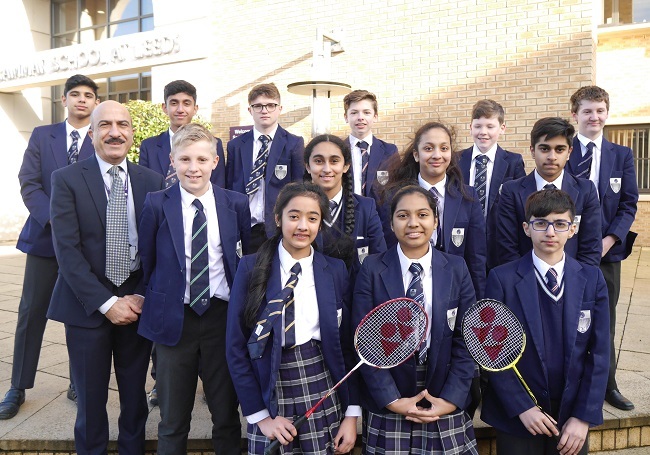 Having secured a clean sweep of four titles in the Leeds round, four GSAL teams – girls and boys in two key stages, KS3 and KS4 – qualified for the county round, held last week at Garforth Badminton Centre. They faced tough opposition with all the top schools players from across the county vying to progress to the regional round and keep alive their hopes of reaching the national final. The KS3 girls smashed their way through the competition, winning all their matches without dropping a single game. The players who took on Wakefield Girls High School, Beckfoot School, Shelley College and Rishworth School were Y9 pupils Asmi Shembekar, Harini Elankhumaren and Agamya Gupta, with Riya Ooken Y8 and Ria Sood Y7. The KS3 boys also won all their games to take victory in matches against Heckmondwike Grammar School, Rishworth, Hanson Academy and Queen Elizabeth Grammar School (QEGS). The players were Cameron Murray Y9, Roddy Robinson Y9, Lewis Wadsworth Y8, Salah Siraj Y7 and George Potts Y8. There was an equally impressive win for the KS4 boys. They overwhelmed the opposition, winning matches against Beckfoot, Heckmondwike, Brighouse High School and QEGS, with only one game lost. Team members are Thomas Crabtree Y11, Ben King Y11, Arnav Chahal Y10, Rohan Ooken Y10 and Vivaan Thopte Y11. Although our KS4 girls won their matches against Heckmondwike, Brighouse, and Beckfoot, they lost against great rival, Wakefield Girls. The players are Y11 students Karen Rodriguez Boidi, Megan Hodge, Mariam Shan and Asumpta De Pablo Carrion, with Akshima Ghosh Y10.